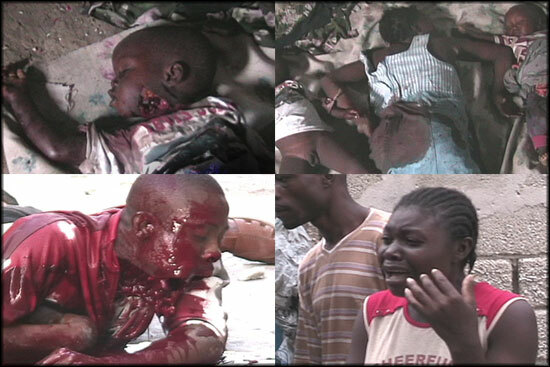 Eleven years ago on July 6, 2005 United Nations "peacekeeping" forces in Haiti (MINUSTAH, the United Nations Stabilization Mission for Haiti) raided the slum of Cite Soleil. What happened during the raid was disputed, until the following documents were released in response to a Freedom of Information Act request. The State Department's reviewers searched the Central Foreign Policy Records, uncovering ten documents. One document was released in full, six documents were released with excisions, and three documents were withheld in their entirety. The released documents appear below. "Haiti: Dread Wilme Killed; HNP More Active." Cable from US Embassy Port au Prince to State Department Headquarters. July 6, 2005. Cable Number: Port au Prince 001796. Confidential. Source: Freedom of Information Act release (2005-05-081) to Keith Yearman. Douglas M. Griffiths, the number two in the Embassy, provided one of the earliest reports on the raid. "MINUSTAH launched an operation into the Bois Neuf area of Cite Soleil, reportedly killing gang leader Dread Wilme and an unspecified number of his associates. [EXCISED]. This will temporary knock the gangs off their feet, but any number of gang leaders can rise to fill the vacuum left by Wilme's death." Perhaps not knowing the severity of the raid, Griffiths encouraged further activity. "MINUSTAH needs to keep up the pressure with continuous small and medium sized operations." "Haiti Post-Dread Wilme: MINUSTAH Takes off the Pressure." Cable from US Embassy Port au Prince to State Department Headquarters. July 12, 2005. Cable Number: Port au Prince 001829. Confidential. Source: Freedom of Information Act release (2005-05-081) to Keith Yearman. Terming the attack on Wilme a "surgical strike," Griffiths is apparently reporting on a conversation with MINUSTAH commanders. "MINUSTAH has effectively abandoned the long-delayed assault of Cite Soleil...the surgical strike on Dread Wilme and his headquarters has put the gangs on the defensive and brought them to the negotiating table." "MINUSTAH's passivity is frustrating," noted Griffiths. Yet he also admitted "MINUSTAH was being accused of killing more than twenty women and children." His source found the statistics "credible." "Haiti: MINUSTAH/DPKO on Reports on Excessive Civilian Casualties." Cable from the US Permanent Mission to the United Nations to State Department Headquarters. July 20, 2005. Cable Number: USUN 001642. Confidential. Source: Freedom of Information Act release (2005-05-081) to Keith Yearman. The State Department's mission to the United Nations was meeting with representatives of the Department of Peacekeeping Operations (DPKO) to discuss the situation in Cite Soleil. "In a conversation with USUN [political officer] on July 18, [the source] described the situation in Cite Soleil as very dangerous, and that MINUSTAH's soldiers went into the area on July 6 for only 5 to 6 minutes to complete the operation...[the source] lamented press reports citing 50-60 deaths following the raid, saying that neither MINUSTAH nor DPKO has information that supports the press reports." Also, "the July 6 MINUSTAH operation that killed gang leader Dread Wilme was meant to be a surgical operation to detain him...the aim was not to kill Wilme or his supporters." "Human Rights Groups Dispute Civilian Casualty Numbers from July 6 MINUSTAH Raid. "Cable from US Embassy Port au Prince to State Department Headquarters. July 26, 2005. Cable Number: Port au Prince 001919. Confidential. Source: Freedom of Information Act release (2005-05-081) to Keith Yearman. MINUSTAH's After Action Report offered a sharp contradiction to what the Department of Peacekeeping Operations had been reporting. In this cable from Ambassador James Foley, "MINUSTAH's after action report stated that the firefight lasted over seven hours during which time their forces expended over 22,000 rounds of ammunition and received heavy fire in return." A [source within] MINUSTAH "acknowledged that, given the flimsy construction of homes in Cite Soleil and the large quantity of ammunition expended, it is likely that rounds penetrated many buildings, striking unintended targets. As the operation was a raid, MINUSTAH did not remain in the area to do an assessment of civilian or gang member casualties..."
It is also noteworthy the Brazilian commander of MINUSTAH, General Heleno, told a San Francsico-based labor and human rights delegation that a Jordanian battalion led the operation. "MINUSTAH's after action report states that the Jordanians played only a minor role, providing perimeter security and firing approximately five percent of the rounds. It remains unclear how aggressive MINUSTAH was, though 22,000 rounds is a large amount of ammunition to have killed only six people." "Haiti: Update in Security Council on Haiti." Cable from the US Permanent Mission to the United Nations to State Department Headquarters. July 28, 2005. Cable Number: USUN 001716. Unclassified. Source: Freedom of Information Act release (2005-05-081) to Keith Yearman. The State Department's number two in New York, Anne Patterson, reports on a briefing by the Undersecretary of the Department of Peacekeeping Operations. "440 troops were directly involved in the July 6 raid that killed Dread Wilme, and an additional 1000 secured the perimeter area. "Brazil Shows Backbone in Bel Air." Cable from US Embassy Port au Prince to State Department Headquarters. August 1, 2005. Cable Number: Port au Prince 001964. Confidential. Source: Freedom of Information Act release (2005-05-081) to Keith Yearman. Ambassador James Foley praises Brazilian soldiers, writing "The security situation in the capital has clearly improved thanks to agressive incursions in Bel Air [a Port au Prince neighborhood] and the July 6 raid against Dread Wilme in Cite Soleil." "Post has congratulated MINUSTAH and the Brazilian Battalion for the remarkable success achieved in Bel Air in recent weeks." "UN Shifts Focus From Disarmament to Violence Reduction." Cable from US Embassy Port au Prince to State Department Headquarters. August 10, 2005. Cable Number: Port au Prince 002032. Confidential. Source: Freedom of Information Act release (2005-05-081) to Keith Yearman. A source meeting with Embassy personnel suggested "the death of Dread Wilme July 6 and the pacification of Bel Air in this summer opened a door of opportunity into the slums.